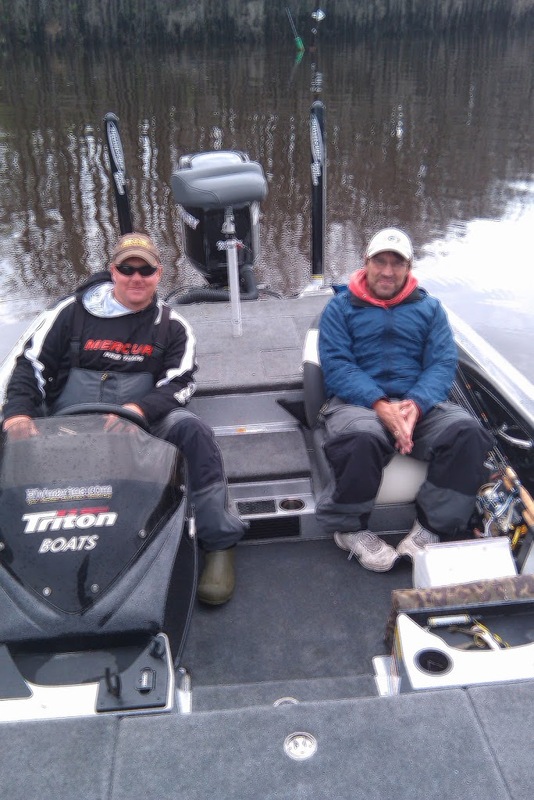 Last Monday my brother-in law Gary and I hired the fishing guide services of Randy Deaver. Of all the fish we caught, got away and had to be set free we were able to get some great Bass fishing pictures of the best of the bunch. We left the White Oak Manor bed and breakfast in Jefferson TX at about 6:30 am for the short drive out to Caddo Lake. We met Randy Deaver from Caddo Lake Guide Service at Shady Glade Marina and headed out on the lake for a morning of fishing. Our target was Largemouth Bass. The fishing started slow and stayed that way for most of the morning. Randy had us try a variety of lures and techniques and we managed to get about 20 fish in the boat. 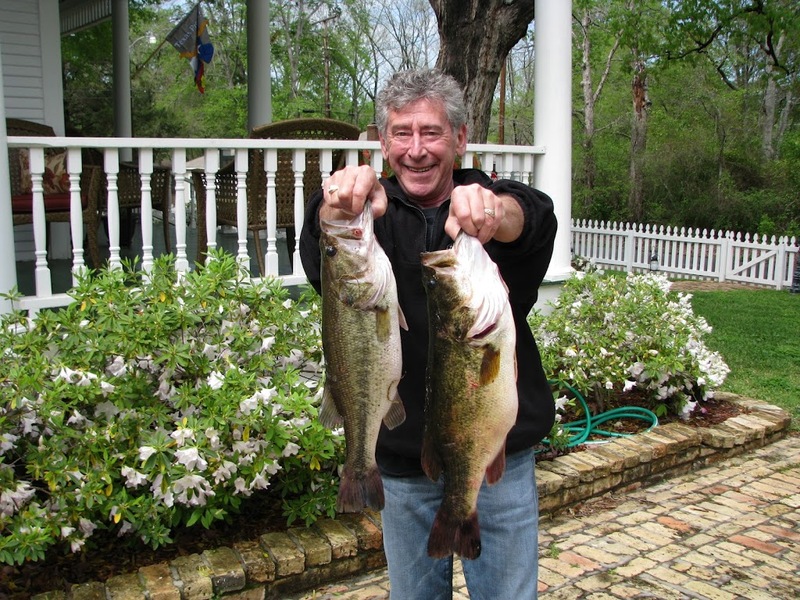 At Caddo Lake, the Largemouth Bass have to be less than 14 inches or over 18 inches in order to keep them. Sadly most of the fish we caught were in that “slot” where we had to throw them back. Of all the fish we manage to keep 4 that we took back to the house for bragging rights. We’d already scheduled to go out with Randy again on Wednesday, so we were hoping to add to our catch then. 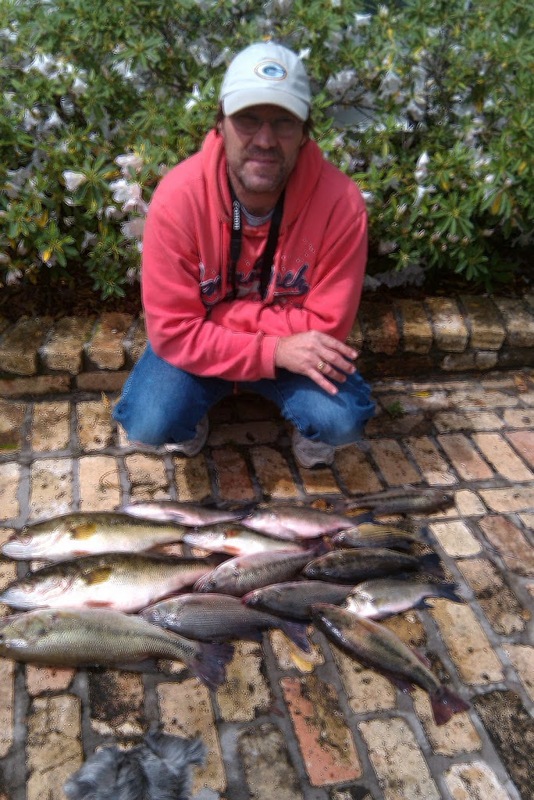 David with a few fish. Gary proudly showing off his fish. It rained all day Tuesday so we were a bit anxious about the trip back out on Wednesday. Thankfully when we woke up Wednesday, there was just a light rain falling. We grabbed what little rain gear we had and headed out to Caddo Lake, Randy was there waiting for us. He had extra rain gear for us which we were thankful for and put on right away. We then headed out to the first location we were going to try. 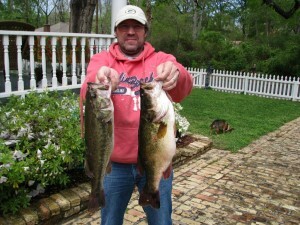 The Largemouth Bass were hitting really good for about the first hour. We boated a few keepers and lost a few that would have been above the 18” limit. Our bright beginning turned and the hits started slowing down. 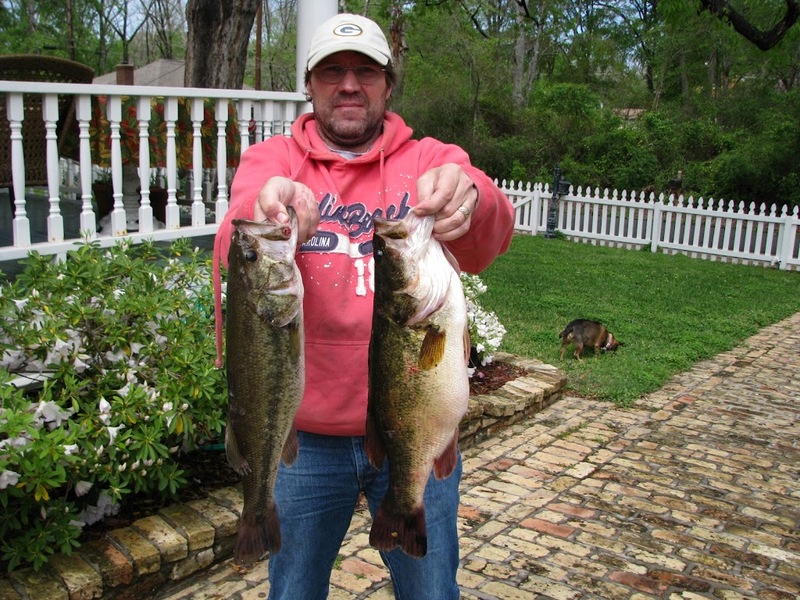 Randy suggested we try a few spots he knew of for some White Bass fishing. We tried three different spots. At each spot, we would catch four or five fish right away then they stopped biting. We just kept going back and forth between these locations. Gary even caught a yellow bass at one location. Even with the rain, it ended up being a great day of fishing. Randy our guide was great and he had nice equipment. He was very knowledgeable and helped us catch a bunch of fish. David with some of his catch. I figured we brought over 60 fish into the boat and lost about 15 more in the two mornings we went out. You can’t beat those numbers. I filleted all the fish and we had a delicious fish fry for 4 people that very night and still have a lot left over for another day. 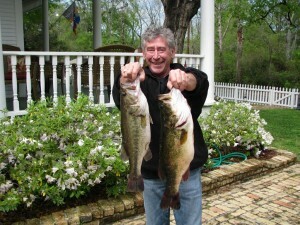 When you’re coming to Jefferson and want to get in a fishing trip at Caddo Lake we highly recommend Randy’s services. 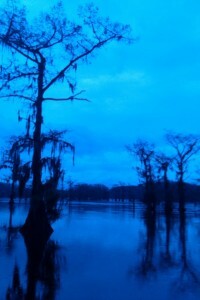 Early morning light on Caddo Lake. This entry was posted in Caddo Lake, fishing by Tammy D. Bookmark the permalink.